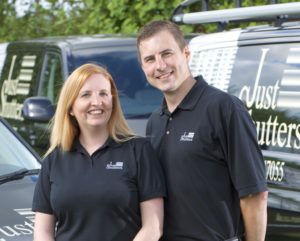 Hayley and Terry Lancaster are your local shutter specialists. With an eye for design and a passion for shutters, we can deliver the quality local service our Just Shutters brand is famous for. Our signature style sets us apart from our competitors while our service and expertise are second to none. Let us show you how and why our customers are wowed by our commitment to excellence. The new Jubilee City of Chelmsford is a thriving, busy place in which to live and work. With its fantastic schools, good sports facilities, flourishing entertainment scene and even city centre riverside living, it is an exciting and prosperous place to be. With an array of architectural styles in the area, you can rest assured whatever your home is 1 or 100 years old, we have the experience, and skill to create the perfect solution for you. A growing number of Chelmsford people are asking for plantation shutters from Just Shutters, your local shutter specialists. From Victorian terraced houses to riverside apartments and every type of home in between, shutters are a great option for your windows and doors. Shutters are beautiful and offer an array of benefits besides, they are easy to maintain, do not damage in sun or heat, offer versatile lighting and shade options and offer real long term value. We have the largest range of styles and finishes in the UK including some exclusive ranges; with more than five louvre sizes, plus a choice of tilt rods and colours, our shutters are an incredibly versatile window treatment that will complement any house and decorating style. Not all shutters are the same; ours are the finest product in the world, come with a lifetime guarantee and exemplary service. Terry and Hayley would be delighted to demonstrate! If you like the sound of that, then do telephone 01245 200917 to discuss your ideas and book a home visit. Please call us on 01245 200 917 or follow the buttons below and we will be delighted to help you further.